A George Balabushka Pool Cue handcrafted, by the legend himself before his untimely death in 1975, was sold by another considered the best Pool player of all time Luther “Wimpy” Lassiter for an astonishing US $ 45,000 in 1994. Considered the highest price ever paid for a Pool Cue and the buyer who bought is unknown, but today this one might be worth very much more because George Balabushka handcrafted only about 1,200 Pool Cues during his lifetime. His Pool Cue making was unfortunately limited to only 16 years, and if any on those that he made becomes available for sale at any of the world’s auction houses, they are sure to fetch a few tens of thousands of United States greenbacks. 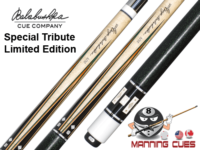 The year 1992 saw something unique happening in the Pool Cue manufacturing industry when the “Ultimate Fantasy Cue” introduced to the market at a fantabulous price of US $ 150,000. It is no ordinary Pool Cue, most expensive Balabushka pool cue it weighs, 9 ½ pounds so it is not one you could play a competitive Pool game with and would not be even permitted near any baize topped the table by the owner. Named appropriately as the Intimidator it is a piece of Pool Cue art, in Three Dimension (3D), which would remain in the eyes of everyone who would have had the opportunity to see it. The focal point in the Intimidator though it is at the base is the Genuine Italian Obsidian Gemstone Sphere which adds to the beauty of it in no small measure but brings the best in it when one imagines the sheer audacity of its craftsmanship. It took over a year to complete this masterpiece which was first an 82-pound solid stainless steel block and took 1,862 working hours in total, which was painstakingly hand-engraved, hand-etched and hand-machined to perfection. The Intimidator has two sets of intimidating steel blades chiseled out of a solid stainless steel bock, one at the aft near the grip which has a wingspan of nine (09) inches and the other blade set at the fore a bit smaller. The total length of the exposed blades on the Intimidator is a staggering 48 inches and carrying it around would equate the person to a reincarnation of a Viking gracing the Pool rooms, and is sure to put the jitters into anyone. It is these menacing two sets of blades, which juts out of the Intimidator which gives it the “persona non grata” status into any Pool room because it could shred any Pool table to bits and pieces. If its blades are menacing so is its look, and at a length of 63 inches, it is a mean Pool cue which would keep anybody who beholds it for the first time gaping with astonishment as to how anybody could have a game with it. 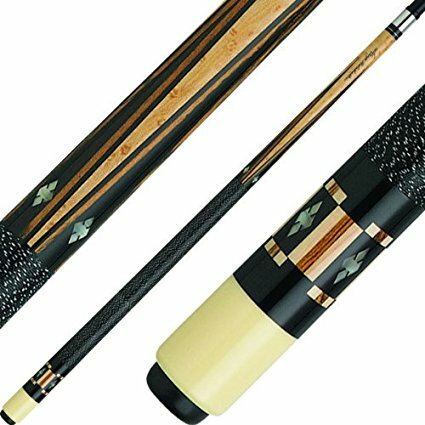 The winged dual sets of intimidating blades inlaid with Gold, Deep Relief, and French Grey Scroll engraving which gives the Intimidator a specialty to set it apart as the most exquisite Cue ever made without any expenses spared. Designed with 210 separately and exquisitely handcrafted inlays embedded with 112 hands polished precious stones on the handle the Intimidator is a masterpiece in craftsmanship and a thing of beauty though menacing to behold. The Intimidator would remain in the annals of Pool history as the Cue that never graced a baized table due to its sheer menacing looks and incapability to engage in a game. It is a Pool Cue all those Pool enthusiasts should take the opportunity to see because it is sheer beauty.